I had my first Outside World review* for the Human Legion last week. A site called SciFi365.net picked up on Marine Cadet and recommended it. Said it was ‘more Haldeman than Heinlein’, which was an interesting insight, and while I’m a great lover of Heinlein, Haldeman’s The Forever War still remains in my mind as the definitive military SF novel, and the key book that turned me into an SF reader when I was a teenager. To those who don’t understand the modern world of SF publishing, having my Human Legion journey go unnoticed by the Outside World might seem strange given that today is exactly six months since the first book in the series was published, and by one of those coincidences you never dare write in your fiction (because no one will believe you) today is also the day the series hit 50,000 sales. Happy times. Click to see why… Also note the publishers. Of the top 6, four are self-published and two are published by 47North. During January 2015, Ann Leckie was the only major published author to enter the top-20, and then only in its outer reaches. The explanation for this strangeness is that I am one of the new ghostwriters of science fiction. By ghostwriter I don’t mean I secretly write under another author’s name, but that I write and sell in an ethereal netherworld where my books can only be seen by special people gifted with the second sight. Or who take note of the Amazon genre charts. *I said that SciFi365.net was my first Outside World review. I’m using that term to mean book bloggers, review sites, or magazines posting a review, interview, guest post, article, or any form of mention of my books. Until last week I had zip. Not a sausage. Not according to the Google Search Alert I have set up for such things. Now, don’t worry. This isn’t a post about a whining sense of entitlement from a self-published author. I’m not annoyed by this, and I am certainly not surprised. But that’s the point. I am just the latest in a succession of science fiction authors to emerge in the past few years who have had moderate to enormous popularity but are invisible to large sections of the science fiction community. We’re ghosts. Ghosts who collectively sell millions of books every year. Now, it seems to me that all this talking of ghostwriters has some relevance at the moment because there’s a gang war currently being fought out in the wilder parts of SF (I mean science fiction and not San Francisco, just in case residents of Fog City look out their window in panic). It’s called the Sad Puppies, and if you don’t know about it already I strongly suggest you don’t look it up as it’s kind of depressing. Let’s just say that there are two gangs hurling scorn at each other over the internet because each side is convinced the other is trying to exclude certain categories of authors, protagonists, and literary styles. Underneath all the disgraceful behavior (and, to be fair, there are a few voices of reason too) is something I find interesting. Both sides in the Sad Puppies gang war think they represent the mainstream of science fiction and the other lot are so inward-looking they don’t realize the degree to which the mainstream has moved on and left them behind. They can’t both be right, can they? Well, actually… in a strange way, I think they are. And the explanation for how that can be possible lies in the degree to which Amazon has emerged as such a powerful taste setter, usurping the role of traditional opinion formers (such as magazines, bookstores, and major publishers). A lot of SF fans find out about books from both traditional opinion-formers and Amazon/Goodreads, and of course good old fashioned word of mouth. All the same, as I’ve just demonstrated, in 2015 if you can get your book to appear prominently on Amazon, that’s all you need to reach a very large number of SF readers. Alternatively, if you set the SF blogosphere to writing and reviewing your book tens of thousands of times, get the major book chains to heavily promote your book, and win every SF award it seems is there to be won… it only amounts to reaching the same number of readers as the Amazon-only approach. Let me give an example. Compare Marine Cadet and the Human Legion series with traditional SF publishing’s poster book of 2014: Ancillary Justice by Ann Leckie. Last year was an astonishing one for Ancillary Justice. Everywhere I went, it seems, there was that slightly blurry cover art. I didn’t like it much at first, but like those clever adverts on the TV that sneak everywhere, it slowly grew on me. If I went into a bookshop, there was Ancillary Justice on maximum exposure, cover side out. If I read an SF magazine, there would be an advert. And then all the awards that flocked to that book: the Nebula, Hugo, BSFA, Clarke, Locus. If you looked in the right places of the SF world, you couldn’t move for someone talking about this book. All well-deserved I’m sure, and I hope it was as much of a thrill ride for Ann Leckie as it looked to be from the outside. In August 2014 I was in Bedford Library, taking a break from finishing the first draft of Marine Cadet, when I saw an interview in The Bookseller in which Leckie was saying her publisher estimated 30,000 sales for Ancillary Justice in its first ten months. I remember reading that figure and having mixed feelings. I was happy for Leckie who sounded delighted, while at the same time wistfully wondering what it would feel like to reach that kind of sales rate myself. And yet at the same time I was underwhelmed. You see, I’d been tracking the space opera and military SF worlds on Amazon for some time, and 30,000 sounded very modest given the sales figures claimed by the top stars to emerge in recent years: Marko Kloos, Chris Nuttall, Vaughn Heppner, and a dozen others… you know the kind of authors I mean. I began to wonder… just an inkling, mind you… whether these self-publishers and 47 North authors were exaggerating their sales (47 North is Amazon’s own imprint that largely publishes successful self-publishers). That wasn’t an idle concern, either. I was writing books in order to earn a living. If the market was smaller than I thought, then it would be correspondingly more difficult to earn enough to feed my family. Then I released the Human Legion on Boxing Day 2014 and I sold 30,000 in seven weeks. Okay, I’m cheating here a little. I released the second book about ten days after the first, so there were really two books making up that 30,000 in seven weeks (for the record, Marine Cadet has only sold 28,000 in its first six months). And now there are three books to make that 50,000 target that I’ve hit today. Just to be clear, I’m not arguing that my book is better or worse than Ancillary Justice; that’s not the point. And I’m sure that if you aren’t a big fan of military SF, then Ancillary Justice is a more interesting book to discuss than Marine Cadet; that’s not the point either. What I do find interesting is that, broadly speaking, my Human Legion series is comparable in popularity with the ‘Imperial Radch’ series that kicked off with Ancillary Justice. And that is despite having zero attention outside of Amazon/Goodreads and a few good friends. Being an all-star was great. 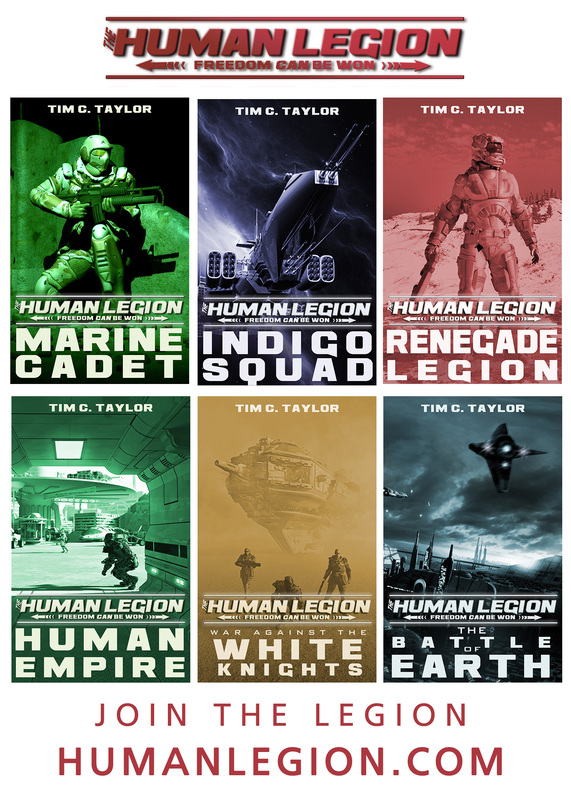 It meant the Human Legion books were two of the most popular in Kindle Unlimted. It was basically me and A.G. Riddle for January sci fi. Click for a close up. Which brings me back to the Sad Puppies dispute. If you were a science fiction reader who took most of your ‘what shall I read next’ decisions based on what was popular on Amazon, you would never be aware of the majority of books produced by the big Top-5 publishers and their many imprints. Sure, there are exceptions from major publishers that you would notice. In the world of Amazon science fiction, two of the megasellers from the major SF publishers in 2014 were The Martian by Andy Weir and A.G. Riddle with the million-selling Atlantis Gene books (which is now in a complex hybrid publishing deal). It’s very noticeable that both were originally self-published. I think we’re going to see a lot more of major publishers poaching successful self-publishers. Anyway, I digress. If the bulk of your science fiction picks come from books highly visible on Amazon, or in the Baen Books catalog, then your world is bursting with brilliant books, and a lot of it from new talent. You will be unaware of the majority of major-published new science fiction titles, which will appear to exist in a different world to you. If you are inclined to believe that major publishers exclude the kind of novels you like, for whatever reason you care to pick, then it would be easy to turn your back on them because from your perspective, the major publishers aren’t publishing many successful books anyway. On the other hand, if you think the Amazon SF charts are stuffed with useless self-published garbage, and Baen is just as bad, then you will be unaware of many of the most popular new authors in science fiction, and you won’t have the slightest interest in these ghostwriters either… or at least until such time as the major publishers poach them, as they did with Andy Weir and A.G. Riddle. Looking at it this way, it’s no wonder that both sides in the Sad Puppies dispute thinks the other is out of touch with the mainstream. 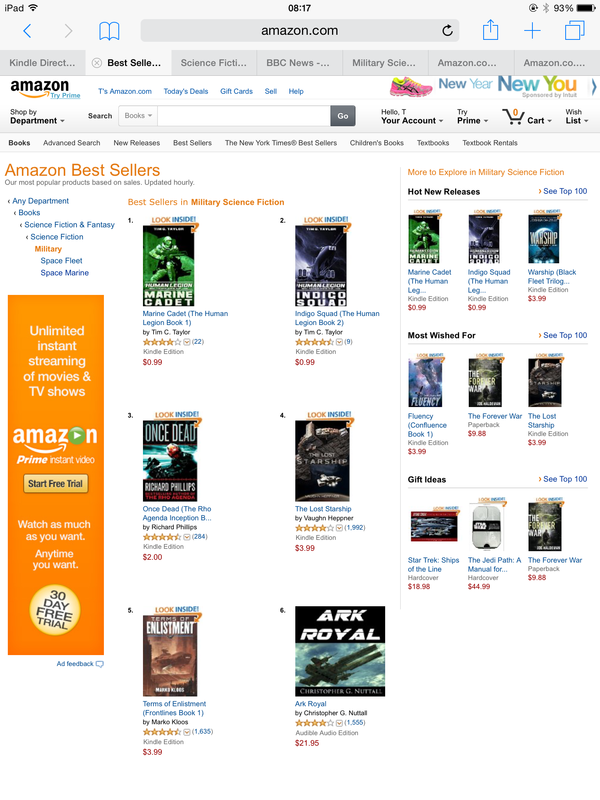 I have tracked the Amazon adult SF charts for a long time now, and having been lucky enough to have several bestsellers, I can translate Amazon sales rankings to unit sales. I can also read industry statements by publishing insider groups, such as the American Association of Publishers, and compare their figures to the sales from outsider or under-represented groups (such as self-publishers). If anyone is interested in me posting them, I can share them in a later post (I regard posts about the Human Legion to be more important than this kind of chatter, and I need to get back to posting more about the worlds of the Legion). But the headline figure is that I calculate around 55% of the adult SF market (in terms of unit sales) comes from self-published authors, 47 North and Baen Books. It’s a very rough estimate (especially for Baen sales), so it’s safest to say that these ghost-authored books represent roughly half of the adult SF market. I think it’s probably more, but let’s stay confident and stick to half. Now we can understand part of the mentality of the most scornful commenters in the Sad Puppy fight. One side claims the ghostly half of SF publishing as its own, and proceeds to point out that many of the major new commercial successes come from these ghost authors. They use these mega sales figures to portray the other side as out of touch. Meanwhile, the other side doesn’t know anything about the existence of the ghostly half of SF book sales and doesn’t want to. In their own way, both sides are right, and both are wrong. Of course, most grown-up science fiction readers aren’t at either extreme of the Amazon-tells-me-what-to-buy/ Amazon-is-stuffed-full-of-garbage divide. Most SF readers are far more intelligent than that. But then, grown-up SF readers aren’t the ones hurling the most disgraceful taunts at each other across the internet in this Sad Puppy dispute. Yes, but does any of this actually matter? Only to the extent that neither the old world of Top-5 publishers nor my ghostly world of Amazon-oriented authors is going to be strong enough to dominate adult SF fiction any time soon. Anyone who insists that one side or the other doesn’t exist, or is soon going to vanish into irrelevance, will look increasingly foolish as they are proved wrong. It’s tempting to say that the ghostly world will continue its rapid rise and come to dominate SF publishing, but I don’t think the old world will roll over and die without a fight. We will see many more examples of major publishers going full-out to recruit successful self-publishers. Even if their editors are out of touch with half of SF readers, they won’t let all that revenue go forever. Expect to see new pulp imprints appear to publish the current ghostwriters. What is certain that this is a period of rapid change and rapid growth in science fiction literature. Don’t believe the industry reports that say SF novels or eBook sales are in decline. All that tells you is that the old world of publishing is giving up space for the ghostwriters. I’m hardly a leading figure in the SF world, but as I raise a toast to my modest six-month anniversary, and salute all my fans, readers, and supporters who have made it all possible, I’m proud to be playing a part in what we will look back and see as an exciting period for science fiction. Tim, you have just put into words the gut feeling that many authors and readers have–the sense that we may be missing out on a lot of good reading simply because we are unaware of its existence. The divide between what we see in the local bookstore and what we see on Amazon is huge. I remember when I first bought a Kindle how shocked I was at the amount of books/authors I’d never heard of. Downloading ebook samples opened up a whole new galaxy of material to me. And yet we see awards, reviewers, and all too many readers who are unaware of these works. It’s sad because they’re missing out on a lot of good stuff. And it’s unfortunate because many authors aren’t getting the chance to reach a wider audience. Even in 2015 and this Age of Internet Wonders, I still know intelligent, good-hearted scifi readers who can build their own computers, but have never ventured beyond what they find at the bookstore or library. How can we bridge this gulf, fix this disconnect? Maybe by the old way–when we read a good book and discover a new author we’re excited about, TELL PEOPLE. It doesn’t matter if we tell them over social media or over a cup of coffee, just spread the word. You’re spot on, Mark. I have some great friends who are linked into the heart of the SF book world who are astonished when I explain to them the size and vibrancy of the ghostly half of the equation. I think they’re excited too. These people aren’t bigots or jealous insiders. They just didn’t know about the true scale of the nether worlds. I am convinced that most SF readers are open minded and generous spirited. It’s just that the other sort is more vocal on the Internet. How nice to read an article that was well thought out and full of common sense. Well done. Having read the 3 Human Legion books and thoroughly enjoyed them may I suggest that you abandon writing for a time and go and sort out the E.U. You will make a fine politician. Put the world to rights now and we may not need Arun McEwan to sort things out in the future. I posted an article on the Human Legion site about how large the world of science fiction self-publishing has become. Warning! For those of a fed up disposition on this topic, I try to reflect my findings upon the Sad Puppies conflict, which is a punch-up that’s flared up over the Hugo Awards.